When I was a freshman in high school we were given the assignment of writing a short story. Our teacher warned us: “Freshmen always want to write bloodbaths. 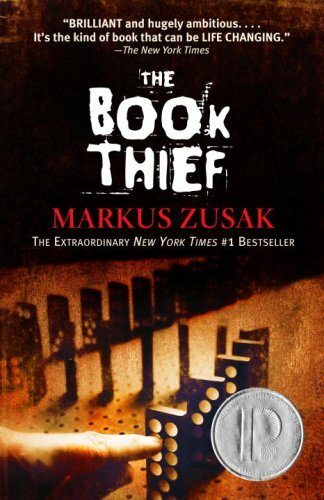 You don’t have to kill people off in your stories.” Nobody told Markus Zusak that before he wrote The Book Thief. I’m not giving too much away. It shouldn’t be a shock that in a book narrated by death, set in Nazi Germany, there are some casualties. The twists and turns of the story, and the love that develops among the characters had me reading quickly, and I finished the sizable book in five days. I found it difficult to see past the book’s tragic plot to internalize what seemed to be the intended “moral” of the story: that words are of the utmost importance. The title character begins her obsession with books before she can even read, and her adolescent maturation is linked to the words she reads and writes. The tyranny of Hitler is blamed on his use of language to control and manipulate. For those of us who live at a temporal and spatial distance from Nazi Germany, it’s easy to reduce Hitler to an evil talking head (talking mustache?) who represents The Worst Thing Ever. While reading it was painful and discouraging to enter a world where people bought what Hitler was selling, and where heroism was a swiftly-punished rarity. Still, after the last page, despite the dismal setting, I was left feeling as if love carries the day. This novel is creatively written in both content and form. I’ve heard it described as life-changing, and I’m not sure I’d use that term. But maybe that’s because I’m blessed to be accustomed to beauty, creativity and tenderness. The virtues of this book, rather than being a revelation, were simply a reminder. Thanks, I’ll have to add it to my book to-do’s. The backdrop you cited reminded me of an acquaintance I had the opportunity and privilege to make a week of two back. Sitting next to me at a Met performance of Don Carlo was an elderly gent named Jacob. With an opera as long as Don Carlo, with two intermissions, I had the chance to chat with Jacob quite a bit. He was from Poland, was a holocaust survivor who lost all of his family, and also was subsequently a refugee on a ship the British blockaded in its attempt to land in Palestine (Exodus story); It was interesting that Jacob actually respected the British for putting up with so much derision and abuse from the Jewish refugees and the Brits stoic and compassionate (?) reaction. I would have thought that he would have been bitter about their turn-back from Palestine. Jacob subsequently, along with the others, endured an interment camp (he in Cyprus) until he was able to immigrate to Canada, where Jacob had a distant relative. (the U.S. refused him for the arcane reasoning and regulations at the time). To Jacob, I noted that he was an inspiration and the ultimate survivor, to which he replied “I also fell off of a second story building one time and lived through that with God’s help” I just had to ask this gentleman if he had one piece of advice for a young man such as I (albeit I am 67), what would it be. While his answer may be considered trite, it was sincere. After a long minute of contemplation, he responded, “Just live for the day… that’s all I can say.” We were both a bit misty eyed as the final acts of Don Carlo began. Now, thinking back on my continuing grief and God-questioning, I have Jacob’s story to fall back on… somewhat of a modern day Job. For me, this, perhaps, not a “life-changing” moment, meeting Jacob, but certainly a “life-influencing” one. I added it to my To Read list last year but I’ve been hesitant to read it. After all, I prefer my narrators to be someone other than Death. But this makes me want to move it up the queue a bit. I too don’t think I would call it life changing, but the heartbreaking story and deeply complex characters have stuck with my the past 4 or 5 years and it is one of those books I will continue to reread. I have always been aware of the power of words and this book has always just reinforced those ideas within me.